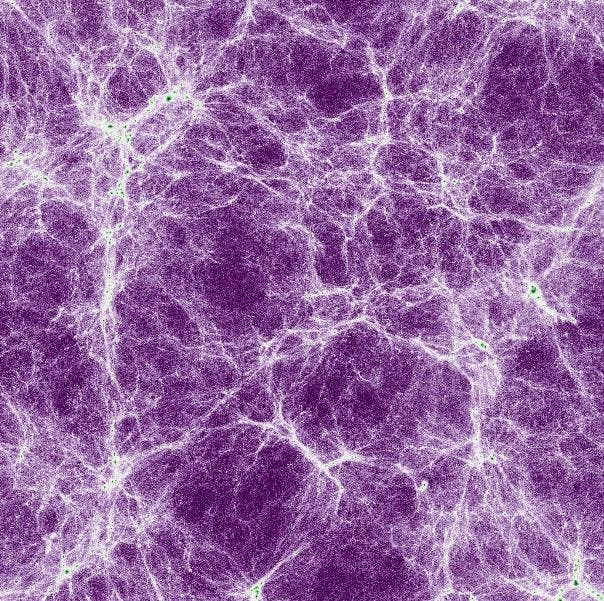 In a paper published July 20 in the journal Physical Review Letters, an international team of cosmologists uses data from the intergalactic medium — the vast, largely empty space between galaxies — to narrow down what dark matter could be. The image above is a depiction of hydrogen gas within the intergalactic medium, or IGM, with bright areas indicating high gas density. Co-authors on the paper are Matteo Viel of the International School for Advanced Studies in Italy, the Astronomical Observatory of Trieste and the National Institute for Nuclear Physics in Italy; Martin Haehnelt of the University of Cambridge; James Bolton of the University of Nottingham; and George Becker of the University of California, Riverside. The work was funded by the National Science Foundation, the National Institute for Nuclear Physics in Italy, the European Research Council, the National Institute for Astrophysics in Italy, the Royal Society in the United Kingdom and the Kavli Foundation.